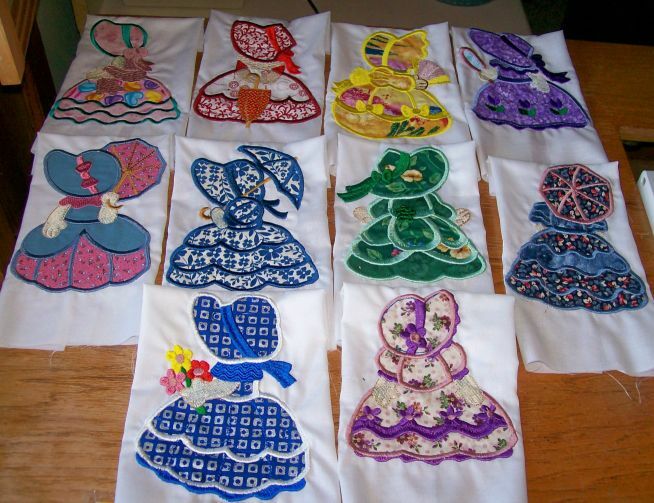 THIS IS A SET OF 10 SUNBONNET SUE BLOCKS. THEY ARE DONE IN EMBROIDERY AND APPLIQUE. DESIGNS ARE 5X7 DONE ON 10 INCH BLOCKS. BACKGROUNDS ARE BLEACH OR UNBLEACHED MUSLIN. (WHAT EVER I HAVE ON HAND WHEN YOUR ORDER IS PLACED) FABRICS VARY FOR DRESSES HATS UMBRELLAS AND ARE ALL COTTON PRINTS. S/H WILL BE ADDED AT PAY PAL WHEN YOU CHECK OUT. S/H added at check out. if you want more than one set, please place another order.